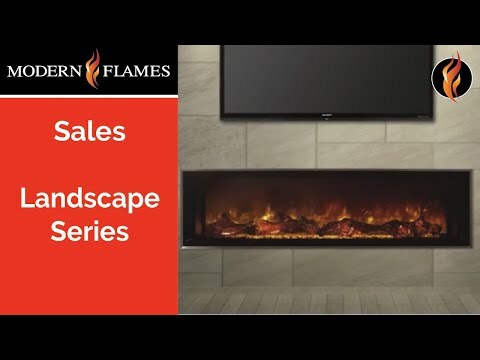 The Landscape Series by Modern Flames is the first of its kind in built-in electric fireplaces. The 60-inch Landscape Electric Fireplace features a frameless design, which allows for edge to edge flame visibility and makes this fireplace the perfect substitute for a linear gas fireplace. The fireplace includes standard coal ember media, 4-piece trim kit, remote control, tether touch screen control, and 5000 BTU heater. An optional Driftwood Log Set or Contemporary Glass Ember Kit is available to be purchased separately. Heating Area 450 Sq. Ft. The electric fireplace is warranted to be free from manufacturing and material defects for a period of 2 years from date of purchase. 450 Sq. Ft. 400 Sq. Ft. 450 Sq. Ft. 450 Sq. Ft.